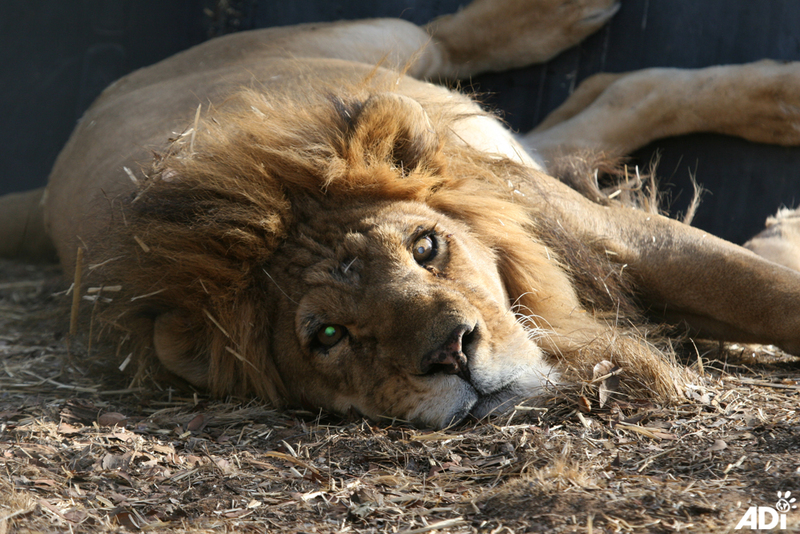 Brief Background: ADI rescued ex-circus lions from Peru and Colombia, find a home in South Africa. 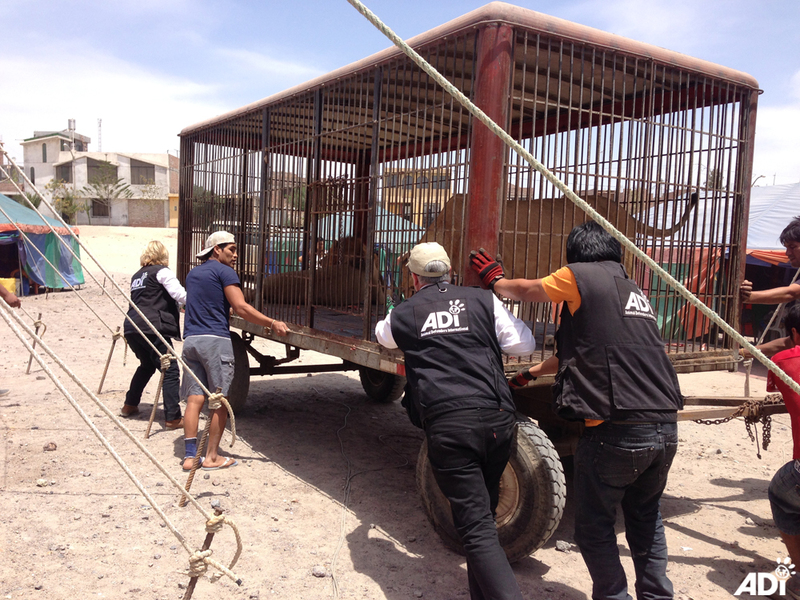 ADI’s Operation Spirit of Freedom rescued around 110 wild animals from circuses and the illegal wildlife trade in Peru and Colombia, including lions, bears, a tiger, six species of monkeys, kinkajous and coati mundis. Homes were built in sanctuaries in the Amazon for the native wildlife and ADI continues to pay for the animals’ care. Hoover the tiger was taken to a sanctuary in Florida, which pays for his care. ADI built large natural bush enclosures (2-5 acres) for the family groups and pairs of friends that made up our thirty-three lions. Those with special needs, such as sight or balance problems from blows to the head in the circus, were provided with smaller, adapted space, minus the challenge of thicker bush and plants with spikes. Our families were transported to Emoya Big Cat Sanctuary in South Africa at the end of April 2016. 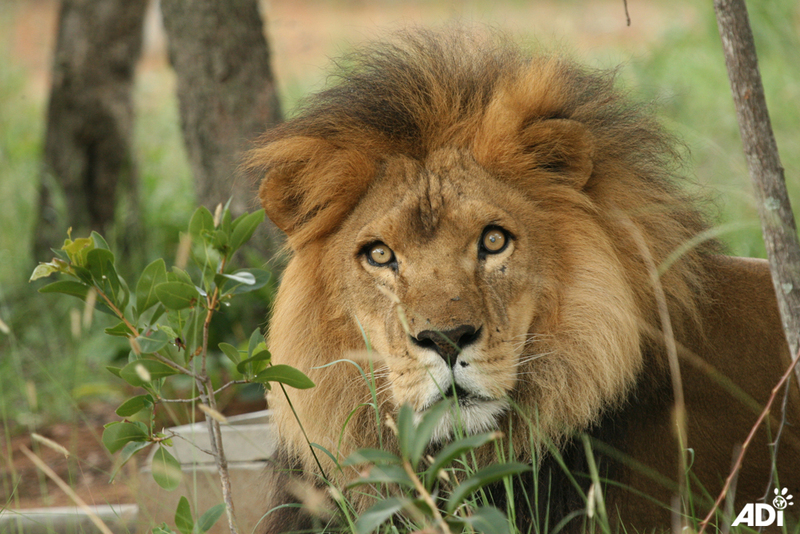 ADI has successfully relocated and maintained rescued animals in South Africa for over twenty years, and found that Emoya is situated in an area with a good climate, natural bush environment and had the space for our huge construction project. One of our ‘special needs’ pairs, José and Liso were sweet, elderly lions who had enjoyed almost three years in our loving care – nearly two years with us in ADI’s temporary custody facility in Peru where we saw them transform from fearful, stressed and unhappy lions to confident, playful and content beings. We loved how they slept with their legs wrapped around each other. Then, they enjoyed just over a year in Africa, under the sun, taking pleasure in their native environment and roaring out their point of view to the rest of the ADI lion families in their enclosures nearby. After a terrible life of suffering and abuse in the circus, José and Liso were free, and it had taken a decade of work by campaigners in Peru and Colombia to end the wild animal circuses. We knew these animals personally. Many of the animals we rescued during the seizure and rescue operations with the wildlife officials of Peru and Colombia, were known to us from our film and footage taken during the undercover investigations of the circuses that led to the change in the law. These animals are our family. After just over a year of peace, in the early hours of 29th May, 2017, a gang broke into the sanctuary and killed two of our dear older boys, lifelong friends and constant companions, José and Liso. Our boys were poisoned by the intruders, then skinned and their heads, tails and feet removed. The autopsy confirmed that José and Liso ingested a huge amount of poison and died very quickly. Their body parts were removed after death. ADI immediately brought in armed guards to watch over our lions night and day, sleeping next to them; extra electronic security includes lights and sensors. We also engaged a specialist investigations team to provide as much support as possible to the South Africa Police Service and the local Endangered Species Investigating Units which are working to stamp out these crimes. The work of the ADI anti-poaching unit includes: Liaise with the investigating officer to offer support and assistance following any attack; collating all available information and updating ADI Poaching Incident Database; geospatial analysis of incident to identify patterns and trends; sophisticated crime pattern analysis such as Repeat and Near Repeat Victimisation. Our investigation and our security improvements are ongoing, but, as we are sure everyone will understand, we are not providing any specific public information on our defences, as we are aware that poaching gangs check websites and social media for information. Africa has been a sanctuary for us, as it is for many international animal protection groups who take animals there to give them back something of the life they have lost. 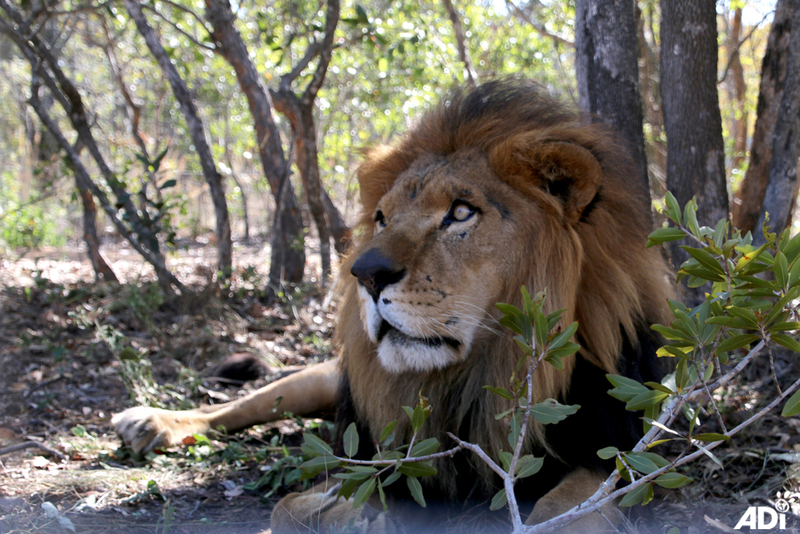 For over two decades, ADI’s other rescued ex-circus big cats have been safe and enjoying the life in the African bush that had been bush denied them. Now, a new, terrible and growing threat is facing not only our lions, but all sanctuary big cats, rhinos and others. The loss of two members of our lion family in this way has been devastating; our grief and anger indescribable. Now we must step up and fight back. These animals only have us to defend them. Time to redouble our efforts. We must get the poachers, not only for justice for our dear José and Liso, but to save other animals from this horrific crime. It is well known that there is a huge international legal and illegal trade in the body parts of wild animals including lions, tigers, elephants, rhinos and others. The trade devastates wild populations because it puts a price on the animals’ heads, ultimately, this is driving the species to extinction. Lions are now valued for their bones for Chinese medicine, now that the tiger bone trade has devastated the world’s tiger population. Many captive and rescued lions are now at risk, because the national and international trade has put a price on their heads. At the CITES (Convention on International Trade in Endangered Species) Conference of the Parties in Johannesburg in October 2016, South Africa gained an exemption to continue their lion bone trade, despite the calls of other countries to end the trade. We, and our colleagues in other animal protection groups, argued it would put all captive lions at risk, putting price on their heads. We were right. This is commercial trade in products. Our precious intelligent, emotional, inquisitive, funny and affectionate individuals are not seen as having their right to life and the enjoyment of their own existence and family life as nature intended. They are reduced to products worth more dead than alive. 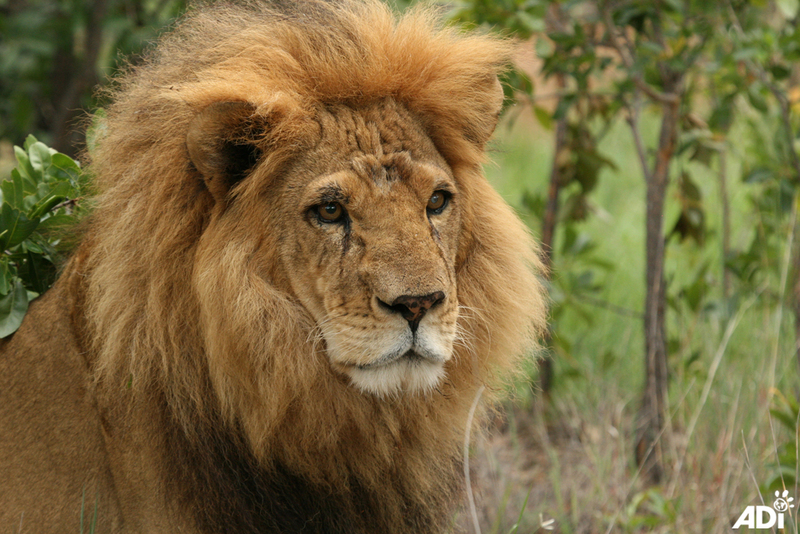 Whether it is the lion bone trade for traditional medicines, or canned hunting, or their skins and heads and paws for trophies, the value of their body parts is a death warrant. Only we can stop this. Attacks by poachers on animals in captivity, not just sanctuaries, is spreading across the world – as far afield as Australia and Europe – a rhino was even killed in a European zoo. Attacks are growing all over South Africa, including a major assault on a rhino sanctuary and of course, we are tracking the rise in attacks in Limpopo province. Over the past thirty years, ADI’s undercover investigations have been the foundation of our successful campaigns – our investigators in Latin America worked undercover for two years; our laboratory investigators can be undercover for years. Long-term investigations are our specialty. So, we are not going away. Animal Defenders International (ADI) exposes the hidden suffering of animals in entertainment, including circuses, films and television, in laboratories, fur farms and other industries. We combine this evidence with research on the scientific, economic and legal case for laws to protect animals. For over twenty years, ADI has led campaigns and worked with partner groups worldwide, to make the case for an end to the suffering of animals in circuses. This is a change whose time has come. Now, nearly 40 countries have passed legislation to end circus animal suffering. The story does not end there, though. Once laws to outlaw the use of animals in circuses are passed, they must be enforced and ADI works with government officials and police to enforce laws, seize illegal animals and relocate them to permanent homes. Wherever possible, to homes as close to their natural environment as possible. The Government of Peru passed a ban on the use of wild animals in travelling circuses, and in 2015, many circuses were defiant and still using wild animals, so it was time for wildlife officials to enforce the law. Having campaigned for the legislation, ADI offered to help the Government in a similar way as we had in Bolivia a few years earlier, which had a similar problem with circuses defying the law and continuing to use animals. ADI offered to provide the logistics and animal handling and relocation support to wildlife officials and police. We assisted with the seizures, built a temporary custody centre to house the animals, providing food, care and veterinary attention. We undertook to relocate the animals to new homes; the native wildlife would be provided homes back in their jungle habitats and the exotic wild animals (lions, a tiger) would be relocated abroad. Similarly, Colombia had passed their ban on wild animal circuses and the first circus had surrendered their nine African lions. Our increased security needs funding. Please send a donation for the guards and extra security measures. Our investigation needs funding. Once the José and Liso case is solved, we must go get the other poachers. Let’s stop them in their tracks. Kill the trade. Become an ADI Anti-Poaching Team Shadow: Make a donation to support the anti-poaching unit, dedicating your contribution to find the killers and bring them to justice. You will be first to know when we nail the criminals. We need YOU to help us win for the animals! We continue to pay for the care of all of the animals we have rescued – bears, monkeys and others at two sanctuaries in Peru, the rest of our lion families in South Africa. The more you can do to help us cover these costs, the more we can do to expand the anti-poaching unit. Can you organize an event at home, to help raise funds for the anti-poaching unit? Or for food, veterinary care and equipment? It is important to change the world for animals in the future, but also to make the world a better place for the animals we have rescued. Our friends at Greater Good / The Animal Rescue Site immediately reacted to the tragedy of our loss, by setting up a fundraiser to help cover additional security and costs of investigating and pursuing the murderers. 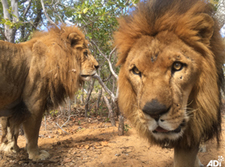 Greater Good / Animal Rescue site helped fly the lions to Africa; they have visited the lions at Emoya and raised funds for ADI’s ongoing veterinary care and feeding at the sanctuary. We are grateful for their support. If you would like to donate to this appeal, please click here.